Google Translated Search was launched as a Google Translate feature that helped you search in other languages. Google automated several steps that made it difficult to find information written in a language you don't know: Google translated the query, used it to obtain the search result and then translated the results in your language. The feature is now available in the search toolbelt and it's much smarter: Google automatically detects the most appropriate languages for your query. Click on "show options", select "translated search" and Google shows a box that lists some languages, the translations of your query and the top search results for those translated queries. 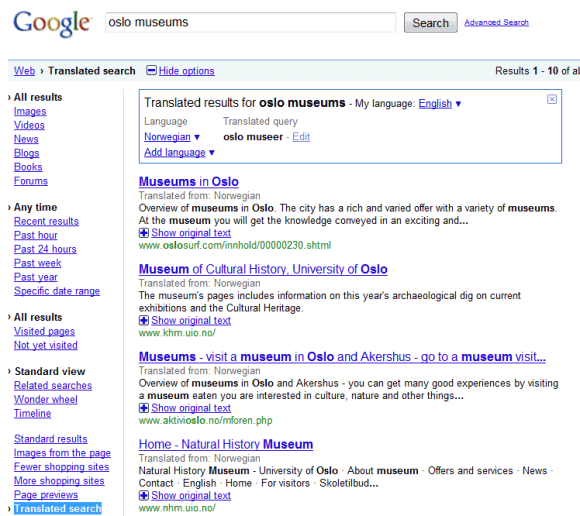 For example, if you search for [oslo museums], Google shows a list of web pages written in Norwegian. 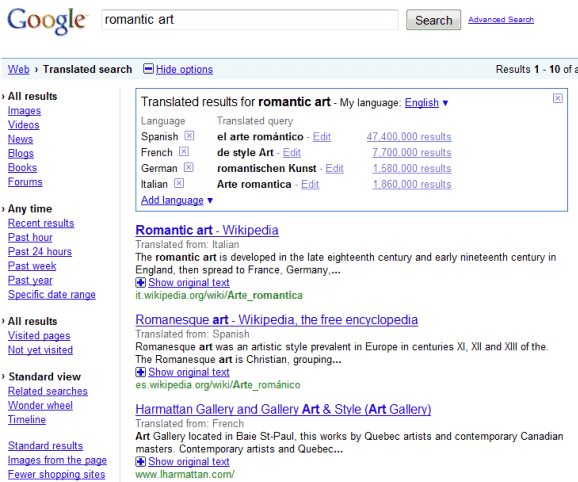 When you search for [romantic art], Google suggests more than one language: Spanish, French, Italian and German. "If you're traveling and want to find hotels, restaurants, activities or reviews written from a local perspective, or if you're just curious to find what's being written about a company, product or topic in another language, give Translated search in the Search Options panel a try," suggests Google. That's nothing new. I have been using it for 2 years. It used to be called Search Across Languages. It does have new features compared to the previous offering - the tool can now search multiple languages at one time, and also can automatically select which languages to search in. The old version required you to choose a single language you wanted to search in.